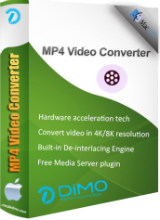 Dimo MP4 Video Converter oferă cea mai bună modalitate de a converti orice SD/HD/4K fișier video populare în format MP4 pentru utilizarea pe smartphone-uri, tablete, TV, dispozitive VR, media playere, video și site-uri de partajare. Codifica fișiere video pentru iPhone, iPad, Android, Sony Vegas, VR, TV, PS4, etc. Oferă funcțiile de bază de editare pentru tine să tăiați/cultură video, adăugați watermark/efecte, etc. 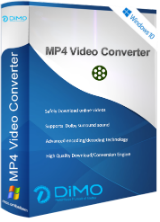 Dimo MP4 Converter for Mac este cunoscut ca cel mai bun Mac MP4 software-ul de conversie pentru a converti orice video MP4 de pe Mac pentru utilizarea pe dispozitive portabile, playere media, online, video site-uri web și mai mult. Today's developer continues to live in a world of its own, stripping out from its very ordinary converter individual components which it then offers up as one-trick ponies at prices so over-the-top they defy belief. Today's single-purpose MP4 converter, at a hoped-for $56 retail, is a case in point. Free MP4 converters abound. So do free video converters which manage every kind of input and output file format. And so, too, do paid-for full service video converters that are regularly offered by major software publishers on giveaway sites such as GOTD. Dimo's cynical approach to marketing and seeming contempt for the intelligence of its target audience would be bad enough. But there's also the fact that its self-proclaimed expertise notwithstanding, it appears to know so little about the world of video that it's quoting Sony Vegas in today's promotional blurb, this despite the fact that Sony's lack of investment in that once renowned product meant it declined to the point where it was flogged off cheap to German developer Magix two years ago and is, effectively, no more. If Dimo genuinely means business, it should take advantage of the excellent platform GOTD provides to all developers and promote the fully functioning software it publishes rather than extracting bits and pieces and pretending they're worth something. Until it does, its succession of one-trick ponies fools no-one. Today's developer continues to live in a world of its own, stripping out from its very ordinary converter individual components which it then offers up as one-trick ponies at prices so over-the-top they defy belief. Today's single-purpose MP4 converter, at a hoped-for $56 retail, is a case in point. Free MP4 converters abound. So do free video converters which manage every kind of input and output file format. And so, too, do paid-for full service video converters that are regularly offered by major software publishers on giveaway sites such as GOTD. Dimo's cynical approach to marketing and seeming contempt for the intelligence of its target audience would be bad enough. But there's also the fact that its self-proclaimed expertise notwithstanding, it appears to know so little about the world of video that it's quoting Sony Vegas in today's promotional blurb, this despite the fact that Sony's lack of investment in that once renowned product meant it declined to the point where it was flogged off cheap to German developer Magix two years ago and is, effectively, no more. If Dimo genuinely means business, it should take advantage of the excellent platform GOTD provides to all developers and promote the fully functioning software it publishes rather than extracting bits and pieces and pretending they're worth something. Until it does, its succession of one-trick ponies fools no-one. MikeR, couldn't agree more!! On their website, the $56 is crossed off and the price of $37.95 is listed, to make people think they're getting a bargain. Almost every tech vendor on the web tries to use this marketing subterfuge, including PC vendors with their ubiquitous "instant savings". "Format Factory" is the BEST and is free so why worry with this software? This company had offered more converter's, most of them with one input-format. Installation etc same as the others. Screen's also. Something I do not understand. A video with a higher resolution(4096) takes almost the same space as a file with lower resolution(640).